2017 Chevrolet Camaro ZL1 vs. 2017 Ford Shelby Mustang GT350R! - Muscle Cars Zone! 2017 Chevrolet Camaro ZL1 vs. 2017 Ford Shelby Mustang GT350R! 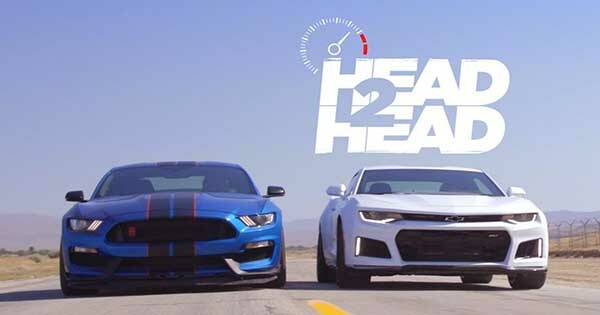 In this one, we have a real clash of the titan scenario between two American muscle gods in the 2017 Ford Shelby Mustang and the new Chevy Camaro ZL1. Jonny Lieberman and Jason Cammisa from the Motor Trend Channel decided to prepare the latest battle from a war that is fought since 50 years ago. Back in 1967, Chevy introduced the Camaro in order to fight back against Ford`s iconic and hugely popular Mustang. This ponycar war has raged ever since. There have been many amazing Camaros and Mustangs for generations. However, these two new models are something quite unique and revolutionary. In one side of the ring sits the most monstrous Camaro ever produced. This Camaro kicks out a stonking 650HP and 650 pound-feet of torque. This Camaro is a great representation of pure American muscle being capable of both defeating supercars and doing the greatest burnouts you have ever seen. On the other side of the corner sits the new 2017 Ford Shelby Mustang. Now, the new Stang on the other hand is a bit down on power. However, even though it lacks some power compared to the 2017 Chevrolet Camaro ZL1, it definitely doesn`t lack sorcery. Just like the Camaro, the Mustang is also able to embarrass supercars costing three times as much. For sure, the Mustang Shelby GT350R has something very special going on. Now, the only question left to be answered is – which of these monstrous muscle cars reigns supreme in the world of the ponycar? Watch the video below and find out! Moreover, check out this C6 racing a GTR and GT500!